There’s one constant in business, and in social media marketing in particular: Change is inevitable. And while change is often in the long-term interest of a company, it can also cause myriad issues for employees in the short-term. In fact, according to research from McKinsey, 70 percent of change programs fail to achieve their goals due to a host of reasons, which we’ll explore in this post. Business leaders must now respond quickly and rapidly to a host of opportunities and threats. Digital and social media tools can make these changes more meaningful and impactful for all parties involved. However, before we can think through how digital and social channels can assist those changes, we must first understand why we as individuals resist change. The curve shows a positive move towards change, with acceptance as the ultimate outcome. 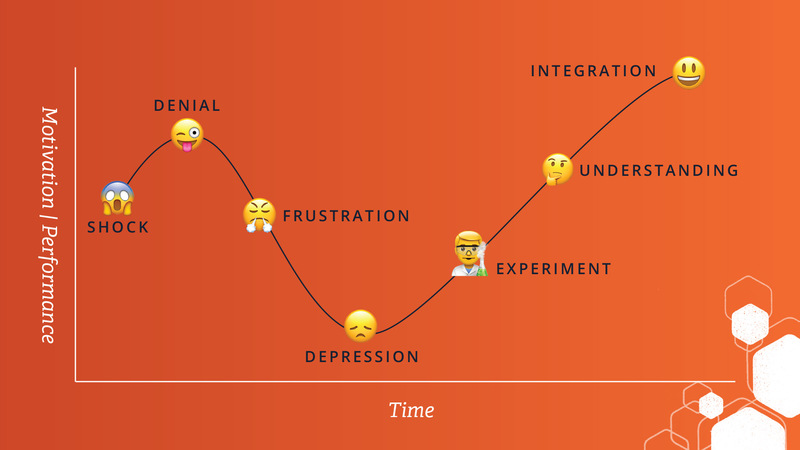 However, unless your organization and leaders actively help move your people through the stages of the curve, individuals may become stuck at any stage. This makes change difficult and could cost your company thousands of dollars. Lack of shared vision and strategy: What are we hoping to accomplish by implementing this change? Has leadership painted a clear vision for the change? It’s important to have a well-thought-out strategy, which should include an outline of the priorities and clear direction for all stakeholders and employees. Timing and change fatigue: Is now the right time to try to implement change? Is the organization coming off a number of recent changes (CEO shift, layoffs), and employees are simply tired of change? Are you in the middle of the busiest time of year for employees (e.g., retailers at Christmas)? As a leader, think through whether now is the right time to implement the change. Lack of leadership visibility and support: Employees need leaders. They need to be inspired, energized, and engaged with change. Someone must keep things moving forward, or the change will never occur. Not enough understanding of the benefits: Employees may ask, “What’s in it for me?” This is a fair question, considering employees are often the ones feeling the greatest effect of the change. Change requires extra effort, and employees want to see their efforts valued. According to a study conducted by Weber Shandwick and KRC Research, many of the employees surveyed wished that their employers offered more digital and social engagement during periods of change. Consider what makes change stick, and you’ll find places where digital and social channels can integrate. Increase urgency and nail the vision. People need to be inspired to move. They need leadership to make objectives real and relevant and to communicate the vision to the broadest possible audience. Company blogs, wikis, or enterprise social networks like Workplace by Facebook can help flatten the organization and drive transparent dialogue. It can also quickly connect the entire organization and communicate the need for and benefit of the change, and the role of each individual. Empower action. Digital and social channels enable a feedback loop from all employees to the guiding team, helping remove key barriers and obstacles to change implementation. A channel that allows employees to communicate their concerns and participate in the change will make them feel valued and invested in the process. Create short-term wins. Change shouldn’t feel daunting or completely unachievable. Set up goals that are easy to achieve, and utilize digital channels to track progress against those goals. Interactive timelines, digital progress bars, and social contests rewarding employees for completing change-related tasks can keep employees engaged, motivated, and feeling like they made an impact. While change can be difficult, don’t let up. 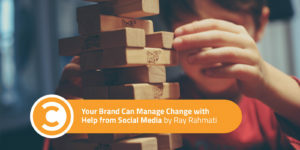 Digital and social tools may not be the silver bullet that will drive immediate change, but they’re a critical supplement to traditional communication channels. Solidifying your communication strategy ensures everyone understands the part they must play and the value they contribute. This will make the process much smoother. This post is part of a paid sponsorship between Spredfast and Convince & Convert. Learn more about the Spredfast platform here and request a demo to see how it can help your brand succeed. A version of this post originally appeared on the Spredfast blog. Ray Rahmati is Spredfast’s lead social business consultant in the Mid-Atlantic region, serving customers’ needs with everything from strategic guidance to planning and training. He is also a professional and college sports fanatic and second-screener who can be found tailgating on any given Saturday or Sunday.